Ah, the making of a video tutorial...sometimes we have a successful sitting and sometimes things just, well, fail miserably. This week, my hair being in limbo as I wait patiently for my appointment with a local (very in-demand) stylist, I decided to film a comparison video between curling irons and my new curling wand. Unfortunately, when I went back to edit this video , I found that my external mic had not been working and no audio was present. Sad sad stuff. But such is the lay of the land when you are a dingaling who forgets to film a simple test video before digging in for a meaty hour-long filming session. As most of you know, my hair is very fine and stick straight. Therefore, a heated set has never been a favorite of mine. I find that heated sets last about as long on these humid Memphis summer days as a plate of cupcakes would in my household. Lovely friends Cherry Dollface and Ashley Marie have wonderful success with a heated pin curl set and indeed most of my favorite vintage stylists seem to prefer hard setting the hair in this manner. But for straight haired little ol' me, I get 15 minutes of lovely waves and that's about it. A cold or wet set of pin curls, perming rods, or foam rollers is always my setting of choice. That said, I received an offer recently to review one of those conical curling wands, so having experience with curling irons but having never used one of the clipless varieties, I decided to accept the offer and film a comparison review. As you know, the review didnt pan out but here are my thoughts. I apologize for the lack of visual aids but I didnt anticipate falling back on photos. Curling irons produce tight uniform curls when properly used. The clip keeps the end of the hair neatly position against the barrel so a smooth bouncy curl is the result, as opposed to a spiral wave. This is much the same result I get from my Remington Tight Curls and a little looser than the curl I get from Hot Sticks, which I actually prefer in spite of their flaws. To prevent damaging the hair with the hot curling iron, the best way to spin the hair is to start at the root and steadily turn the hair, feeding it through the loosened clip until you reach the end. Holding the hair just a few more seconds should result in a bouncy smooth curl without having to hold the delicate ends of the strand against the hot iron for very long. To allow the curl to cool and assist in longevity, simply release the hot curl into your hand and spin it back into a pin curl, clipping it to your head to cool so that it looks like a little standing loop. 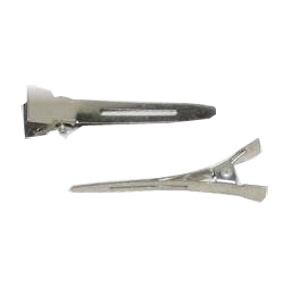 You can use bobby pins to do this but a pronged alligator clip is usually the better option. Once the curls are completely cooled, spray with a flexible hold hairspray, release the curls, and style. These curls tend to have more longevity than a traditional hot roller set and the biggest pro is that, if you are styling someone else for an event, no matter how thick their hair, if you've got clips; you've got curls. In other words, you won't have to worry about running out of rollers. A curling iron can also be used like a curling wand by simply ignoring the clip, although sometimes hair can tangle on the clip. You can also remove the clip temporarily to try out the 'wand' idea for yourself and see whether you prefer it. It can be tricky to get the 'feeding the hair through' technique down so that a lot of ladies have damaged their hair by overusing a traditional curling iron. If it doesn't get HOT, a curling iron is pointless, so even with heat protectant spray there is the danger of damaging hair irreparably by using them too much. Most people have been taught to use the iron in the standard way: clip the end of the strand of hair against the iron, roll in, hold, release. The trouble with this is that the ends of the hair, the most damage prone parts, are resting for the longest time against the heated barrel. This is obviously not ideal and in addition to that, most clips will leave a bit of crimp at the end of the hair as well. So learning to use a curling iron properly is important and I for one am too impatient to use this method of setting my hair very often. A curling wand comes in several shapes, unlike the curling iron which is fairly standard other than the size of the barrell. There are spiral curling wands, conically shaped ones, standard ones, and some that are shaped like an inverted cone. Since the tool itself is modern, the curls they create are 'modern' as well. Beachy Waves are more popular than retro curls for everyday wear, so many of these wands are marketed for that blowsy, breezy look. For those of us who love a vintage aesthetic however, they can still serve a useful purpose. The Karmin Professional wand I received had a swivel cord that won't tangle and a feature that allows you to set the temperature according to preference (my cheap curling iron only has a 'low' and a 'hi' setting). The conical shape of the one I received allowed me to control the size of the curl by concentrating my hair towards the end or the base of the wand, thus creating graduating sizes of curls. Wrapping the hair around the iron and allowing it to twist as you do so, will result in a spiral shaped wave as opposed to a bouncy curl and when these are clipped to the head and brushed out together, the result is a beautiful wide wave, . Wrapping the hair flatly around the wand is a bit trickier but it can be done. And the curl will look more like those made with a standard iron. It is also much easier and less time consuming to spin the hair around the wand and a cinch to slide the curl off the iron and pin to the head. Little or no 're-rolling' should be necessary. I've seen lots of girls use a curling wand w/out the protection of a thermal glove and I salute them. I couldnt do it. Burned myself BADLY. Once I obtained a glove, it was easy though and I enjoyed using the wand and the curls it gave (while they lasted). You do have to be careful because I see no way that the end of the hair can be made to curl without touching the iron itself and uncurled ends just don't say 'retro style' to me. The curls do not seem to last as long as those made with a traditional curling iron, although this may be due to my inexperience with the tool and not the tool itself. All in all, I prefer the curling iron. The wand is handy for touch ups but really, I'm just too clumsy for one and think it's a little dangerous for a beginner. The curls produced by a hard set of curling iron produced dry pin curls is definitely preferable to me over a traditional hot roller set. But when it comes to a heated set, I prefer Hot Sticks over all and get a much better result from them, assuming I'm in a climate where humidity isn't a factor. 'Three's a Party'-(matte black, matte white, and a satin finished currant red color). In the former palette, the black is definitely the star. It's got incredible pigmentation and pay off, produces little fall out, and blends pretty easily. It also did not crease at all when placed over a primer. The white shadow is easy to layer but needs building up to be truly opaque. It's also a little chalky in texture. The red applies somewhat patchy but blends and builds well. The color is muted and wearable, unlike some truer reds, and has a 'merlot' quality when blended in with the black. Wet N Wild is my pick for the best colorful drugstore shadow brand, hands down, especially considering the price. The latter palette is more wearable and contains three colors that are STAPLES for me in the summer. I love a 50's blue eyelid with a subtle earth tone in the crease. Unfortunately, unless placed over a white base, the blue shade in the 'Muse' collection is very sheer and needs lots of building up. It's also the chalky one of the bunch. The peach and brown shades both have very nice color pay-off however and I've been wearing them a lot. The brown is a particularly good choice for the crease when applied with a blending brush. It pairs beautifully with the peach tone that initially seemed too dark for the brow bone but actually works really well for that. On a drugstore scale of 1-10, I give 'Three's a Party' a solid 8, and 'Muse and Carouse' a 7. Thanks for bearing with me in all my trials and tribulations. See you soon! I can't wait for your new video, Lisa!